Sinus Dilation Devices Market size is set to exceed USD 3 billion by 2025; according to a new research report by Global Market Insights. Sinusitis affects a large population base across the world. As per the Center of Disease Control and Prevention’s National Health Interview Survey, 30.8 million people in the U.S. were diagnosed with sinusitis in 2017. Furthermore, lifestyle changes, comorbid diseases as well as environmental factors will further surge the number of people suffering from sinusitis. Growing rate of chronic sinusitis will offer high growth opportunities to the players operating in the sinus dilation devices market and thereby will accelerate the industry size in coming years. Rapidly ageing population base prone to various chronic diseases owing to functional and structural changes will serve to be a major impact rendering factor on sinus dilation devices business growth. According to the United Nation’s World Population Ageing report, there were 962 million people in 2018 aged 60 years and above and the number is estimated to double to reach 2.1 billion by 2050. Moreover, technological advancement in sinus dilation devices will further favor industry growth. However, limited adoption of sinus dilation procedures in under developed economies owing to presence of sinusitis drugs and high procedure cost may hamper industry growth over the coming years. Balloon sinus dilation devices segment accounted for more than 33% revenue share in 2018 and is anticipated to witness lucrative CAGR during the forthcoming years. High segmental growth is attributable to focus of industry players on product differentiation that help in improving the accuracy of the sinus dilation procedures. Surging demand for balloon sinus dilation devices in sinus treatment will foster segment growth over the forecast period. Standalone sinus dilation procedures segment accounted for high revenue in 2018 and is estimated to show 9.0% CAGR over the forecast timeframe. Growing cases of sinus in developed as well as developing countries will primarily drive the segment growth. Growing preference for standalone dilation procedures owing to its high success rates will further favor segmental growth. Hospital segment dominated the sinus dilation devices market with USD 830.4 million revenue in 2018. Growing cases of chronic sinusitis is expected to drive the segment growth during the forecast timeframe. Furthermore, the government in developing countries is undertaking initiatives to lower the cost of sinus dilation procedures being conducted in hospitals thereby fostering the segment growth. 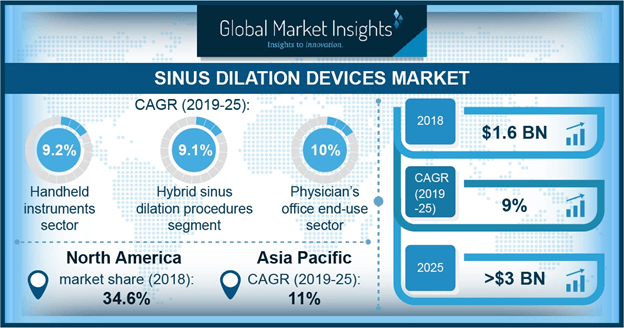 U.S. sinus dilation devices market dominated North America region with USD 522.2 million in 2018 and is estimated to show similar trend during the forecast timeframe. Growth is attributable to high prevalence of sinusitis in the country. High demand for technologically advanced products coupled with strong foothold of key industry players in the U.S. will further augment the sinus dilation devices business growth. Germany sinus dilation devices market held significant revenue share in 2018 and is anticipated to witness 7.4% CAGR during the forecast timeframe. Large number of people suffering from acute and chronic sinusitis will drive the business growth. Moreover, well-developed healthcare infrastructure coupled with increasing healthcare spending will further boost the industry growth in Germany. Notable business competitors operating in the sinus dilation devices market include Entellus Medical, Acclarent, SinuSys Corporation, Medtronic, Intersect ENT, Olympus Corporation, InAccel, dalENT Medical, Meril Life Sciences, Jilin Coronado Medical and Creganna Medical. These competitors implement several inorganic and organic strategic initiatives to strengthen their market position and enhance product portfolio. For instance, in July 2016, SinuSys announced receipt of FDA approval for its entire range of sinus dilation devices. FDA approval for innovative products including Vent-Os system, that offers easy and tolerable sinus dilation, enabled company to enhance product portfolio and strengthen its customer base.